Gareth Porter is an investigative historian and journalist specializing in U.S. national security policy. He has been writing about the Shahram Amiri case since the beginning and appears to have good sources. I spoke with him on several occasions. Here is the article in which he quotes me. It's pretty close to what I said. As far as identifying me, I was a U.S. Air Force intelligence officer assigned to CIA, but for most people, the difference is meaningless. I still am unsure as to whether Amiri was a true defector or an Iranian "dangle." We may never know. 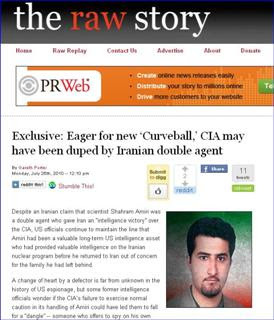 Here is my earlier piece on this, The "defective" Iranian scientist - curiouser and curiouser.